As a field of Electrical Engineering, Power System Engineering deals with the Generation, Transmission and Distribution and Utilization of Electric Power and Electrical Devices connected to such systems including Generators, Motors and Transformers. 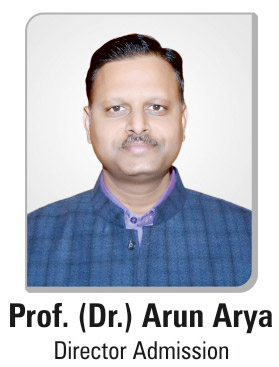 With the aim to conduct internationally competitive research, Arya College offers the M Tech in Power system. The quality research is supported by thesis on Real Time Data of 100 KV High Voltage Testing Lab, 1.1 KV GSS and PLC Lab. The impact of our research is demonstrated by regular National and International conferences and our highly cited publication. (i) The candidates who have passed B E / B Tech Examinations (in related branch of engineering) of RTU or any other recognized University / Institution or any other examinations recognized as Equivalent thereto by competent authority. (iii) Candidates having M Sc, MCA and are seeking admission to certain M Tech programmes should posses valid and qualified GATE score of the relevant branch. The equivalency of any degree for admission to any programme will be decided by University. The eligibility criteria given in the following table are minimum and mere possessing the same does not qualify the eligibility for admissions. University may prescribe any other requirements over and above these conditions. If a recognized university has an approved conversion formula of CGPA into percentage then it will be applicable on producing the certificate of conversion from the concerned University.